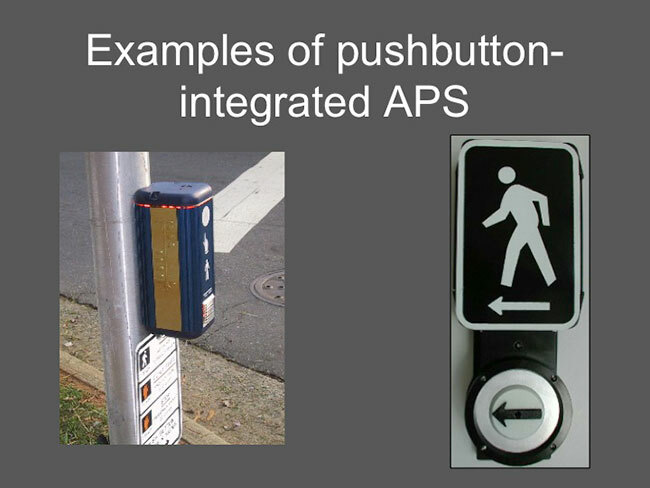 On this slide are two photos of pushbutton-integrated APS. One has a rapid tick walk indication and the other has a speech walk indication. When you click on the play button in the boxes below, you’ll hear a pushbutton locator tone, followed by the audible walk indication, then the pushbutton locator tone again. Any manufacturer’s device can be programmed to provide either tones or speech messages. You may notice that the locator tones are different tones, however they both have a repetition rate of once per second. This content requires the Macromedia Flash Player. Click here to get it.